Magnetite ensures your windows will perform for you and the environment. Glass is the greatest source of energy loss in any building, with up to 40% occurring through windows. Our retrofit double glazing is a sustainable investment with no fixed term that offers a range of energy and environmental benefits. Energy Conservation and Cost Savings â Less energy use and the reduced need for artificial heating and cooling can save you money on energy bills. Retrofitting, in addition to increasing energy conservation, provides an extra environmental advantage of avoiding landfill due to the reuse of existing window materials instead of replacement materials. Carbon Footprint â Interior heating and cooling are a direct cause of carbon emissions, which can be avoided by insulating windows, creating a greener building or home. Compliance â There are some current mandatory disclosure requirements in regards to energy efficiency ratings for existing residential and commercial buildings and more programs will be implemented in the future. 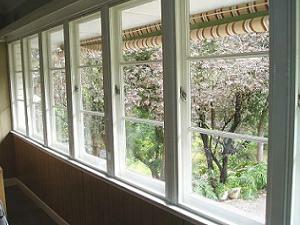 Retrofit double glazing is an easy and affordable way to prepare for energy assessments by creating a greener building. Condensation - Minimise the effects of warm moist air meeting cold air at the window surface to limit condensation, which reduces mould providing a healthier indoor environment. Comfort â A more comfortable home interior, or internal commercial space all year round. Magnetite takes its commitment to retrofitting and the built environment seriously. We place a high value on knowledge and have joined the team at Ecospecifier to ensure our secondary double glazed window insulation system is audited for Green Star. We also have an ABSA member and Green Star accredited professional on staff to provide an industry perspective to our clients.